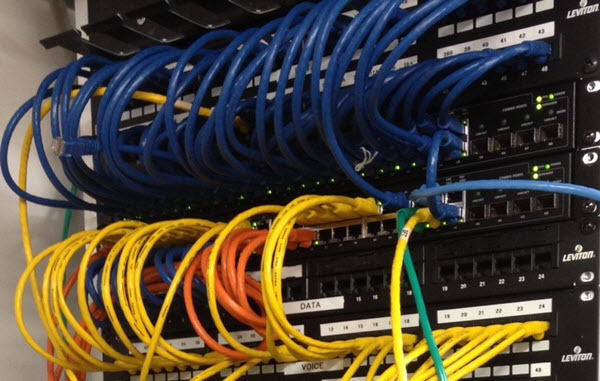 We can set up or troubleshoot your entire internal office network. We can connect all of your computers to share files and set up network printers. When you set up a new workstation in your office, we can install the necessary network cables to connect the computer to the rest of the network. We can install a secure wireless network to allow you to work from anywhere in your home or office. We deploy Enterprise-Grade Ubiquiti Unifi access points that are cloud-managed and monitored for stability. Go beyond the limits of copper wire. Fiber can connect buildings that are miles apart. It is also useful in building risers where the distance exceeds the 300′ limit of copper. We can set up secure access to your office network from anywhere. Now you can work from home or across the globe. If you have more than one office, we can connect them with an always-on vpn tunnel. This allows workers in both offices to share information seamlessly. We can deploy and maintain your network firewall to keep your network secure from unauthorized access. We understand the ins and outs of DNS from wildcards and aliases to Mx and SPF records. We have experience in deploying and managing a variety of VOIP phone systems.